Augustus Caesar built Nicopolis (“city of victory”) as the capital of Epirus in northwestern Greece. It commemorated his victory over Mark Antony at the battle of Actium on September 2, 31 BC. Nicopolis rested on a peninsula leading into the Ambrakian Gulf into the Adriatic Sea, while Actium sat on another peninsula to the south. Nicopolis became an important city and trade center; Augustus resettled citizens of nearby cities to this site and then transferred his quadrennial Actian games here. On the hill above the city, Augustus constructed a campsite memorial at Nicopolis for his victory in the naval battle of Actium. During the battle, a storm unexpectedly arose and beat against Mark Antony’s ships. Approximately 35,000 men were captured in the battle, and rams from the ships were given as a tithe. Augustus used the rams to decorate his memorial. In 29 BC Augustus dedicated his monument to Neptune and Mars. This Latin inscription was posted above the rams. 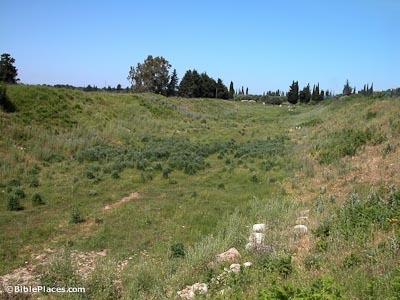 When Paul wrote to Titus around AD 63-65, he almost certainly referred to this site of Nicopolis, given the site’s good winter location and its geographical position in Paul’s travels (Titus 3:12). The subscription of the book says the site was “Nicopolis of Macedonia” (in Thrace), but this was added later and is probably incorrect. 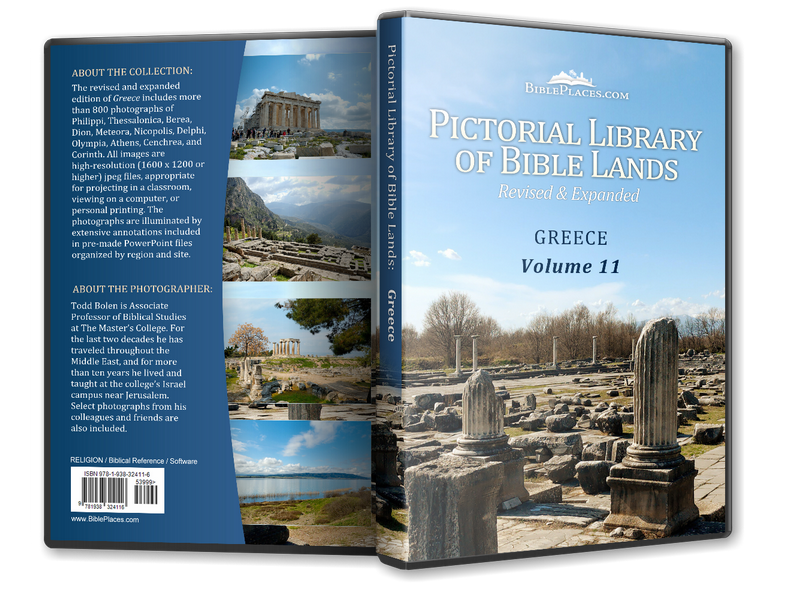 Paul may have intended to start a church on the western coast of Greece at this time, since such had not been done during his missionary journeys recorded in Acts. The building pictured at left is a nymphaeum preserved to 30 feet (9 m) high. 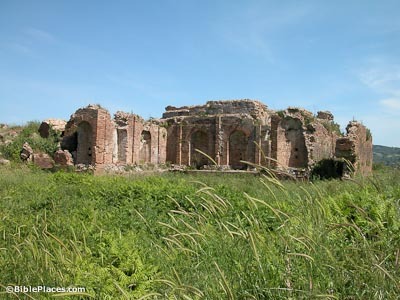 The odeum of Nicopolis was built in the late 1st century AD and used until the late 3rd century. At one point a roof covered the structure. 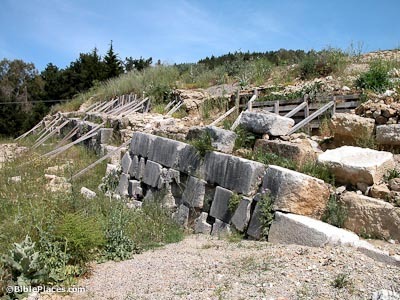 In the first century BC, Herod the Great gave Augustus a large sum of money for initial construction of Nicopolis, including a temple and other public buildings. 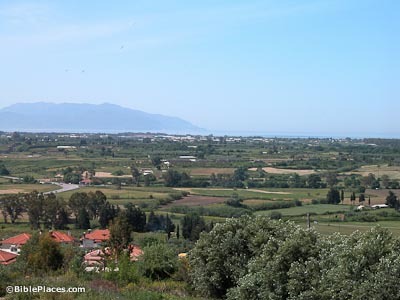 The Greek Archaeological Service has excavated the site of Nicopolis (the modern village of Smyrtoula) since 1913. 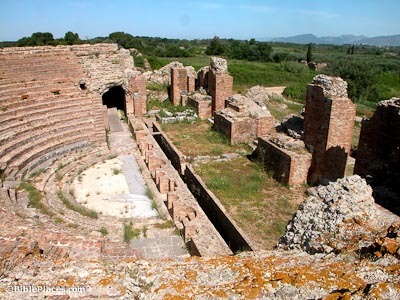 Major archaeological remains include a stadium, theater, odeum, nymphaeum, baths, gymnasium, basilicas, aqueduct, and city fortifications.